Whether it’s a special occasion or business trip, you can turn your stay into something special with the Spencer Suite at Holiday Inn Melbourne on Flinders. Located on the corner of Spencer Street and Flinders Lane, our Spencer Suite has panoramic views of the Melbourne city streetscape. As soon as you enter the room, you will know you have arrived with our floor to ceiling windows. Each of the Spencer Suites provide 60 square metres to spread out and relax, entertain or work. Spencer Suites have been zoned into living and dining areas with a sliding door to separate lounge and dining for maximum privacy if desired. Spencer Suites have been upgraded with the latest and greatest technology. Sit from the bed or couch and enjoy the 40″ and 55″ full HD Smart TVs which feature over 30 free to air and Foxtel channels. You can now also connect your device to our TVs, so if you would like to watch a movie, it is possible with our HDMI and USB connectivity. For those that have an iPhone or Android phone, these can be charged bedside with our Bluetooth alarm clock. All of our rooms also feature complimentary WiFi, so be assured that you will be able to stay connected. Sleep well at night in your comfy performance plus pillow top bed, which comes with your choice of soft or firm pillows. 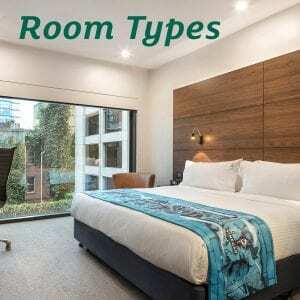 Holiday Inn Melbourne on Flinders is the perfect location for guests to both relax and celebrate in one of the most stylish suites in Melbourne.